As Londoners trek to the polling booth to cast their vote in today's European elections, what better time to celebrate the music of our continental cousins, before the EU get sick of our constant moaning about them all and kick us out. Here's a selection of European music-based events for you to bop along to in the capital over the next couple of months. And we're aware we could have tied this in with Eurovision a couple of weeks ago instead of the elections but, well, no. Söndörgő are a world music group from a town near Budapest. Their popular style drafts in various influences from all across eastern Europe to pull clear of the slightly twee sound Hungarian music is occasionally guilty of drifting towards. They play at festivals all across the continent and have a new album Tamburocket, out later in the year, described as 'a cross between archaism and modernity'. On 26 July, Söndörgő play the Walthamstow Garden Party, a free event organised by the Barbican. And here's a spot of Söndörgő to whet your appetite (and it's actually very good). Rebetiko is type of music from mainland Greece that was first developed in the 1920s, gradually sucking in influences from American jazz and swing, Latin and Indian music, capitalising on Greece's position at roughly the middle of the world (trust us, it's scientifically proven, honest). 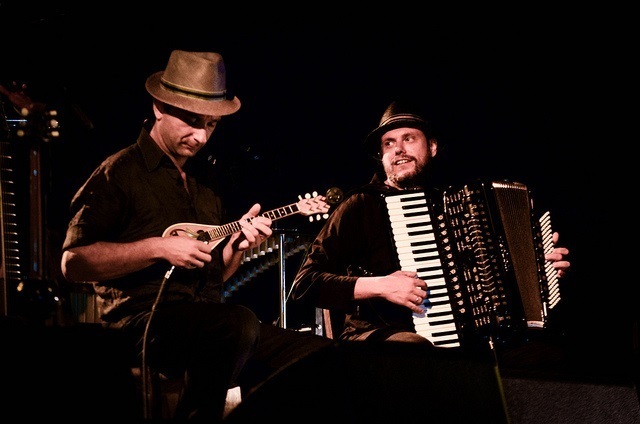 And for the whole of June, London can enjoy a festival exploring this unusual combination of musical styles, with events ranging from open jam sessions to violin masterclasses, and a great many performances from rebetiko stars such as Alexandros Koustas and Pavlos Melas. And if you're still not sure what rebetiko is about, this next video is for you. On 18 June, the Italian Cultural Institute in Belgravia will host It Makes No Difference, an operatic-theatre piece which encompasses music, lyric drama, theatre, literature, philosophy, graphics and fashion design. The piece is composed by Simone Spagnolo, regarded as one of the most promising composers of his generation. You can see a trailer for this 'operatic comedy of impasse' below. An exceptional Czech emsemble trio, consisting of Lucie Sedláková Hůlová on violin, Martin Sedlák on cello and Slávka Vernerová Pěchočová on piano. They play in a rather unusual venue on 27 May: the house of a chap named Bob Boas, 22 Mansfield Street in Marylebone, where concerts are frequently put on to support the Nicholas Boas Charitable Trust which supports young musicians at the start of their careers. Bookings are via email or telephone — check the link above, and check out the Kinsky Trio below. A rising star in the French jazz guitar scene, Thomas Dutronc comes to London for the first time with a show at the Jazz Cafe on 26 May. Inspired throughout his life by the music of Django Reinhardt, Dutronc has won various plaudits and awards in France and now hopes to spread his jazz manouche and swing style across the channel. Here's a video of the man himself in action. Look out Nigel, the Romanians are coming — one in particular, to the Kings Place cultural centre in Kings Cross on 6 June. Oana Catalina Chiţu specialises in recreating the tango as played in Bucharest in the 1930s, and takes a particular interest in the work of Maria Tănase, the ‘Romanian Edith Piaf’ who was active either side of the Second World War. The music of Tănase will form the backbone for the evening's show, and you can sample Oana Catalina Chiţu's style below. We end with a celebration of all things Swedish, with a special night at the Scared to Dance club night in East London, on 31 May at the Moustache Bar in Dalston. The list of famous Swedish artists is longer than you might think and the night will include some genuinely excellent music from The Soundtrack of Our Lives, The Wannadies, The Hives and First Aid Kit, among many others. We recommend you fully expect to hear that Peter Bjorn and John song with the whistling off all the adverts, perhaps a touch of ABBA, and if you're lucky, a bit of this lot. Details of each London event can be found via the links above.